Set at the base of picturesque Cheyenne Mountain, the Rodeway Inn nearest Fort Carson in picturesque Colorado Springs, features free breakfast with eggs, hot and cold cereals assorted pastries and more, outdoor pool, and some rooms with free high speed internet access. Within minutes of the World Arena, Broadmoor Hotel, Seven Falls, the Air Force Academy, Olympic training facility, Fort Carson, Old Colorado City and shopping. Rooms with HBO, ESPN and CNN. 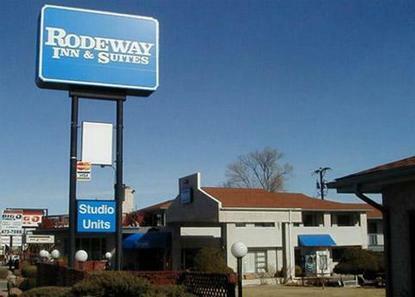 You get more with Rodeway Inn and Suites. Our nearest economy hotel to Fort Carson. Pet Charge: 10.00 per stay. Deposit: 10.00 Refundable. Limit 2 pets per room. Pool under renovation through June 2, 2008.